While emerging market equities have not fared well in 1H 2011, we continue to see various tailwinds for emerging market equities in the form of cheap valuations, strong growth potential and positive market dynamics. * On a year-to-date basis, EM equities have underperformed their developed market counterparts. * Current concerns weighing on EM equities include inflationary concerns, weak corporate governance, and global economic concerns. * While such risks are not to be ignored, they do not detract from the long-term structural growth story of emerging markets. o Strong, sustainable earnings growth, riding on the underlying growth potential of developing economies. o Positive market dynamics, primarily on the basis of strong capital inflows. o Low valuations, both on a historical basis, as well as when compared with developed market peers. 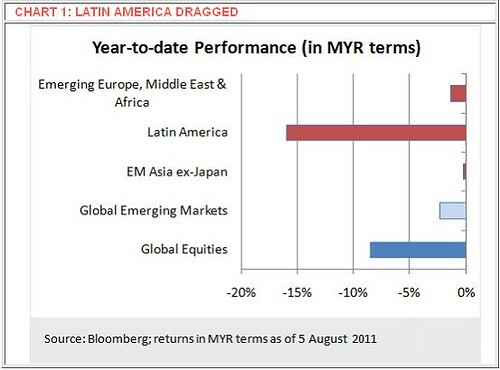 Emerging market (EM) equities had a relatively poor first half in 2011, with the EM equity benchmark (MSCI Emerging Markets) declining 2.3% on a year-to-date basis (in MYR terms on a total return basis, as of 5 August 2011). This compares favourably with the 8.5% decline of the broad MSCI AC World index, or the US-centric S&P 500 which declined 6.0% over the same period. As shown in Chart 1, weakness in Latin American equities weighed on the overall performance of EM equities, with the Latin American benchmark index declining 11.9% year-to-date. Within the EM equity space, Asia ex-Japan was the best-performing region, declining 2.4%. Inflation has been a central theme for much of 2011 so far, and there are concerns that rapid policy tightening in response to inflationary pressures could hurt economic growth in the region. While inflation is a well-known problem associated with fast-growing emerging market economies, current inflationary pressure appears to stem mainly from elevated commodity prices rather than the typical demand-driven factors which often culminate in the “overheating” of the economy. Commodity prices have since come off their April 2011 highs, which could ease some of the inflationary pressure going forward. Also, given that traditional monetary policy measures have more of an impact on demand-push inflation, rate hikes by EM central banks may be viewed as more of a normalisation of monetary policy, rather than an outright attempt to quell growth in the region. Few EM central banks have hiked their policy rates back to levels seen prior to the 2008-2009 global financial crisis (while elevated at 12.5%, Brazil’s Selic Target Rate is still lower than the 13.75% seen in 2008) resulting in relatively loose monetary conditions, and we see little risk in a sudden slowdown in EM economies as a result of policy tightening. In addition to heightened inflationary concerns, the weakness in EM equities this year also stems from various other issues, like weak economic growth and sovereign debt issues in the developed economies, supply-chain disruptions resulting from the Japanese earthquake, as well as corporate governance issues, particularly in the case of China corporations. While these risks are not to be scoffed at, they appear largely transitory in nature and do not detract from the long-term structural growth story of emerging markets. Just as importantly, these problems generally do not have a direct impact on EM equity markets. Rather, the issues have suppressed investor risk appetite, which has translated to weak stock price performance. “Growth” is a central theme for EM investing, but what is often considered a cliché sometimes gets forgotten in a period of weak investor sentiment, and is worth reiterating here. We view emerging markets as having superior economic growth potential vis-à-vis developed economies, with favourable demographics and urbanisation trends supporting growth. 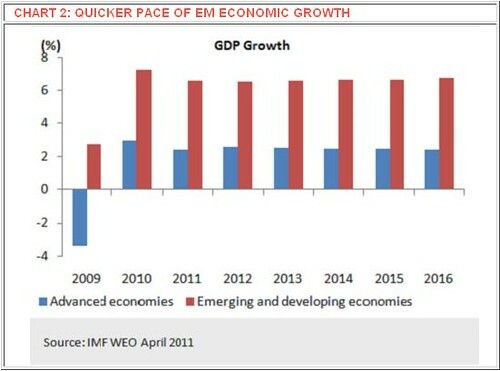 As shown in Chart 2, economic growth in emerging and developing economies is expected to be sustained above 6% over the next five years, with a 6.6% compounded annual growth rate which is substantially stronger than the 2.5% annual growth rate forecasted for advanced economies. A quicker pace of economic growth flows through to corporate revenues and profits, translating to a higher sustainable rate of earnings growth, which we consider a crucial input for the determination of stock market returns. 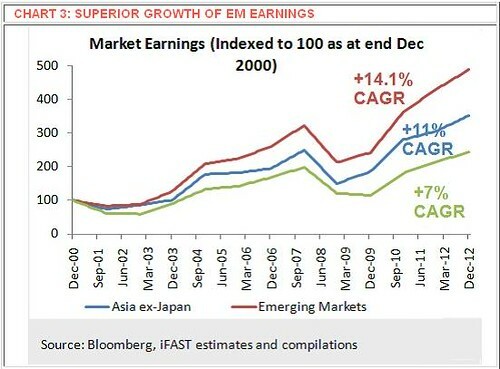 Chart 2 clearly highlights this phenomenon, with earnings of EM equities expected to post a 14.1% compounded annual growth rate from 2000 to 2012, more than twice the 7% growth rate for global equities on the whole. Thus, assuming no changes in market valuations, EM equities should be expected to post returns commensurate with their superior rate of earnings growth. In the current market environment, various problems have created a “two-speed” global economy which has left interest rates at extremely low levels in developed economies and at more moderate levels in emerging economies. 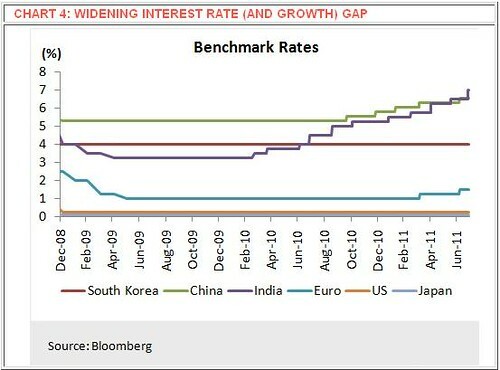 Capital tends to flow to assets where higher returns can be achieved, and with an interest rate gap opening up between emerging markets and developed markets, capital will have the tendency to flow from developed markets into emerging markets to benefit from interest rate “carry”. In addition to the interest rate differential, the growth differential also offers better opportunities for investments in emerging economies (where higher rates of return on investments can be achieved). 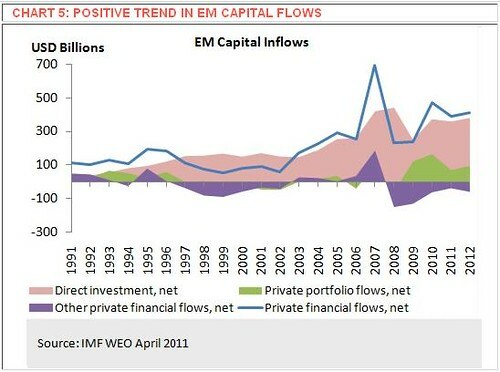 Ultimately, the availability of such capital flows will have positive implications for EM asset prices, and while there is a risk of short-term capital flow reversals which may result in heightened asset price volatility, the stronger growth fundamentals of the EM region will likely attract more capital flows over the longer term. Given the scarce growth opportunities available in developed economies, one would think that a growth premium would be incorporated into EM equity valuations. Fortunately, investors have been unwilling to pay more for the region’s superior growth fundamentals under the current muted market environment, which means that EM equities can still be bought at fairly attractive valuations. 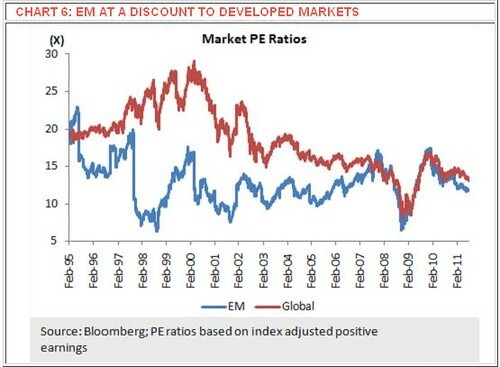 As shown in Chart 6, EM equities remain at a discount to developed markets, despite their stronger growth potential. Also, EM equities currently trade at 10.1X 2011 estimated earnings (as of 5 August 2011), with valuations declining further to 8.9X and 8.0X for 2012 and 2013 respectively, a hefty discount to the long-term 12.8X average since 1995 (based on index adjusted positive earnings). Similar to the relationship between economic growth and earnings, stock market performance has been driven by earnings of the underlying companies (as shown in Chart 2), with the S&P 500 gaining an annualized 7.1% (excluding dividends) from 1946 to 2010, while the earnings of the underlying stocks have grown by a similar compounded annualized rate of 7.1% over the same period. Driven by the underlying profitability of companies, the S&P 500 has also fluctuated to a large extent over a single calendar-year period, chalking up losses of as much as 38.5% (in 2008), or gains of 45% (in 1954). Nevertheless, the long-term trend indicates that earnings have grown at a relatively stable rate, aiding the equity market in posting similar returns over the long term. The OBJECTIVE determines the route really?? ?